The Barrister Brief: What's the Difference Between A Barrister and a Solicitor? Inquiring Minds Want to Know! What's the Difference Between A Barrister and a Solicitor? Inquiring Minds Want to Know! I'm frequently asked the question: "what's the difference between a Barrister and a Solicitor?" It's definitely a good question, since Canada is one of the only places in the world to still commonly use both terms, but not pigeon hole lawyers into one class or another. In the United States (and a great deal of the rest of the world) there are only "lawyers," who are occasionally known by different names, like counsellors (a term we don't use in Canada, though we do use "legal counsel" or "Crown counsel"). The U.S. also likes the term "attorney." Canada has attorneys too, but they generally aren't lawyers. Rather, attorneys in Canada are people acting with "power of attorney" for someone else. Which is really where the U.S. term comes from, although technically the term in the U.S. should always be "attorney-at-law" to distinguish lawyer-attorneys from other kinds of attorneys. However, strangely enough in Canada we still like the terms Crown Attorney and Assistant Crown Attorney for our provincial prosecutors, though not for federal prosecutors who (I practiced as one for many years) tend to use the term counsel (or senior counsel or general counsel) to refer to themselves. And to additionally add to the confusion, lawyers in Quebec who advertise in English tend to translate the French term Avocat as "Attorney," rather than as lawyer, or barrister, or solicitor. More confused now than when you started reading this post? Well, let me sort things out for you then. 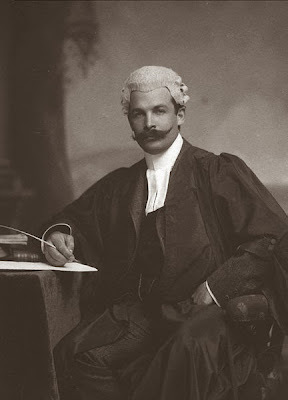 In England and Wales, where most of the legal traditions in both Canada and the United States (and a whole lot of the rest of the world) originated, there has been for centuries a distinction between Barristers who go to court, and Solicitors who don't go to court but rather draft/register documents for clients and retain Barristers on behalf of their clients to argue cases in court. It can take English and Welch Barristers many years of additional training to qualify in their profession than it does for Solicitors to qualify in England and Wales. It's true that being a Barrister may seem more glamorous to some than the life of a Solicitor, but reality often doesn't match fantasy since Barristers there depend on Solicitors to pay them for their services, whereas in Canada Barristers like me can be retained directly by clients. In North America that traditional distinction between Barristers and Solicitors never really took hold, perhaps due to a shortage of Barristers, and perhaps due to the great geography involved where small town Solicitors would have had to have continually called on big city Barristers to travel out at great expense to argue local small town cases. The one place in Canada that a formal Barrister-Solicitor distinction seems to live on is Quebec, which has Avocats and Notaires, however the distinction is not directly analogous to the one in the U.K. Quebec's civil law traditions originally imported from France should have included Avocats (effectively Barristers arguing cases in court) and Avoués (effectively Solicitors), however Quebec like the rest of Canada wound up with fused professions of both Barristers and Solicitors simply being referred to as Avocats, some of whom go to court, and some of whom handle out of court matters. However, Quebec also has the separate profession of Notaires (Notaries) who are capable of drawing up and registering notarial acts, and effectively handle quite a bit of the work that Solicitors handle outside of Quebec. Both Avocats and Notaires go to the same law schools in Quebec (I had a number of students in my class at McGill who chose to become Notaires), but then do different bar schools and write different qualification exams. You'll have to trust me that there are good reasons why everyone doesn't just want to be an Avocat. The powers and training of Quebec Notaries should not be confused with those of Notaries in the other provinces of Canada. Notaries outside of Quebec possess very limited powers mostly concerned with certifying particular types of documents and don't need to be lawyers . Their role is similar to (though not identical to) Commissioners of Oaths. Thus on my bilingual business card in Ontario, on one side it reads Barrister & Solicitor, but on the other side it simply reads Avocat since the French translation of Solicitor is still Avocat. Whether lawyers outside Quebec use the term Barrister, or Solicitor, or both terms, is largely a matter of personal preference and practice focus. Some lawyers who only go to court (doing either civil or criminal cases) will simply put the term Barrister on their letterhead. They're trying to send a message that court is the only thing they do. Other lawyers (even the ones who mostly go to court, like me), will put both Barrister & Solicitor on their business cards, to let the public know that we have both kinds of qualifications (even though in truth there is only one qualifying process), and to also convey that we from time to time do out of court work like drafting documents for clients. In Canada, Solicitor is also often used as a synonym for counsel or lawyer, but never for Barrister. As in, we speak of the "Solicitor of Record" in a court case (even though he is really practicing as a Barrister) and in Ontario lawyers are governed by the Solicitors' Act (but not by the Barristers' Act, which is almost entirely devoted to who get to speak first in court - seriously). Unlike in England, I've never heard anyone in Canada say (like in Coronation Street): "after I have a pint at the pub, I'm popping around to see my Solicitor." Rather, we always go to see a Lawyer. Now, I know by this point you may be sorry about ever having thought of asking a loquacious lawyer like myself the difference between a Barrister & Solicitor. But hopefully now you'll understand a bit of why the answer lies in a mix of history, politics, and simply how professional folks like to present themselves to the world.